Ever see an item of clothing and just know that it is meant to be on your body? That happened with this jacket. 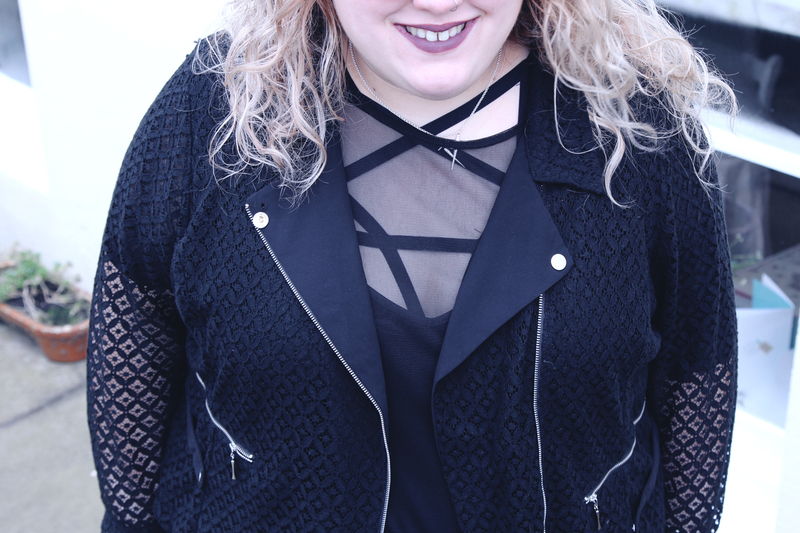 This is the City Chic MOD Biker Jacket* from Evans, and it is one of the best things I have ever worn. City Chic have been stocked on Evans for a little while but I hadn't had chance to try them out, but Evans kindly sent me some pieces for a photoshoot I did recently (photos coming soon!) and one of them was this absolute beauty. This outfit feels like peak Kitty, like I have finally achieved the plus size outfit of my dreams. 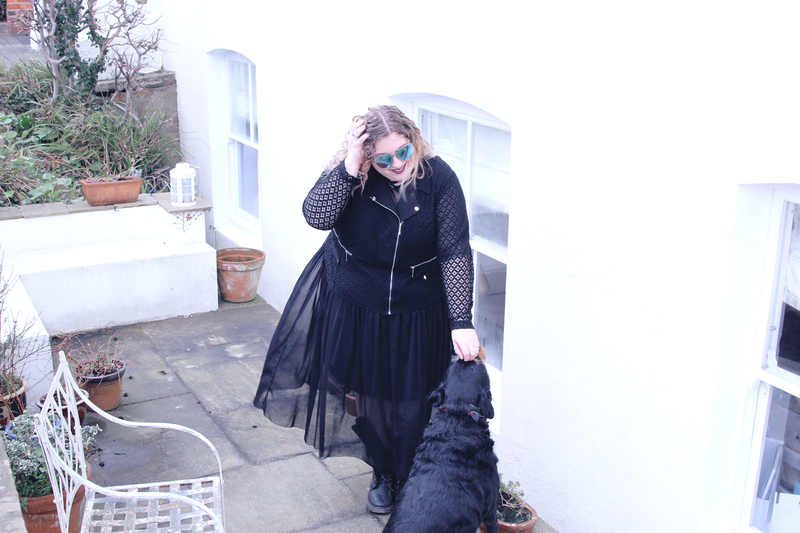 The mesh dress is actually two layers, a simple camisole dress, and then the mesh skater dress is a totally separate layer, so you could wear it over anything you liked. 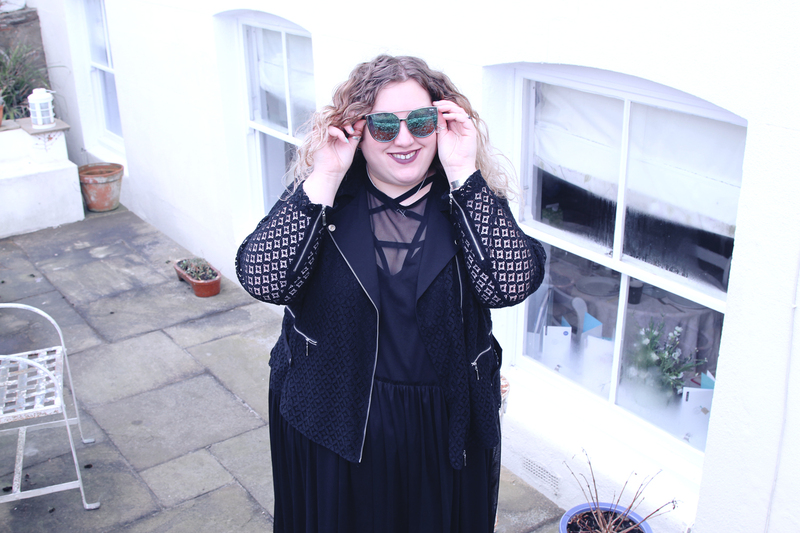 It sold out almost immediately on ASOS, but you never know, it might come back into stock! To make it look a bit more put together I wore my favourite Malice harness underneath it. There are a lot of companies that make harnesses, and a lot who have ripped off this design, but Malice are the originators and I adore them! Oh this jacket, this jacket is just everything. I love a biker jacket, and this is something truly exceptional. 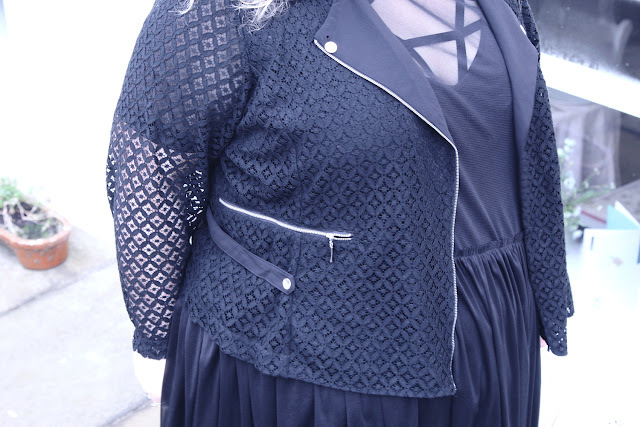 The actual jacket is sheer lace, so whatever you wear underneath it is visible which I love. 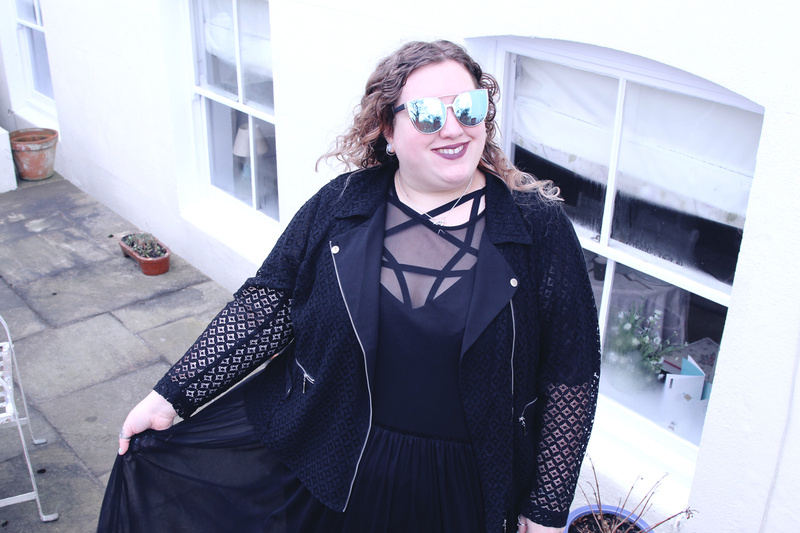 So often I feel like a jacket hides an outfit, but not this one! The details of this jacket are just everything. It has functioning zip up pockets that are big enough for your phone to fit in comfortably, and these lovely mesh straps give more depth to it. It zips up on one side which is a favourite style of mine, the lapels have a mesh underside and the hardware is all silver. Silver hardware is SO rare these days and it's my favourite! The sleeves have a zip up them too, I've worn the jacket with them unzipped with the sleeves rolled up too and it looks awesome both ways. The fabric of this jacket means that while it adds some warmth, it isn't too warm, so I can see this being my go-to jacket for those cooler summer evenings. Every time we go out lately to somewhere I know will be on the warmer side I opt for this and always get compliments on it! 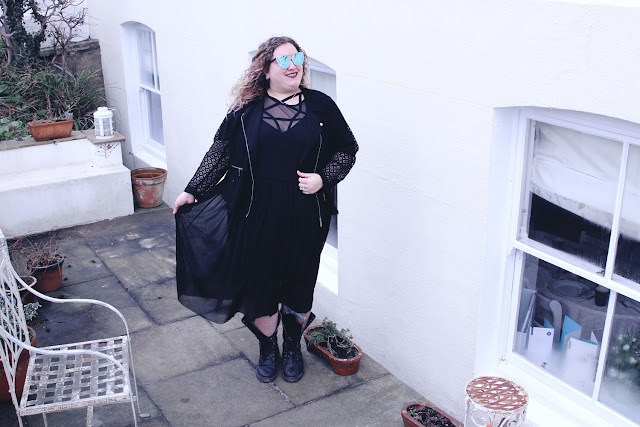 This outfit is just me in a way that plus size fashion doesn't often allow me to feel. It felt liberating and incredible to wear something that is exactly what I want, rather than just making do. The City Chic range on Evans is definitely a new favourite and I wish I'd tried it out sooner! *denotes an item that was gifted to me. In no way does this impact upon my opinions which are entirely my own. OH MY GOD THIS OUTFIT. 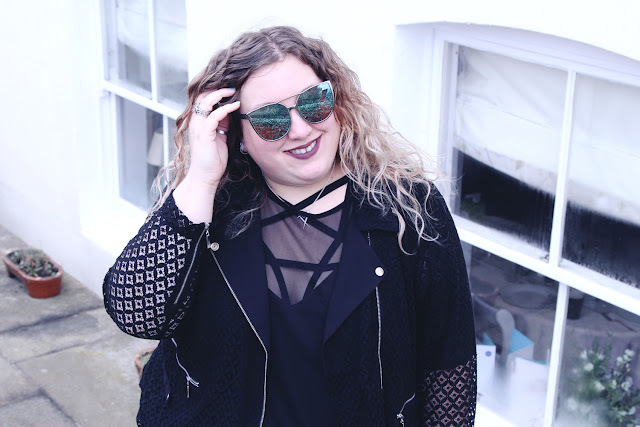 The jacket is amazing, yes; but that floaty mesh layer and of course the trademark Kitty sunglasses! Love it. This is such a cute outfit and I adore all the details on the jacket. I love how you put this look together hun. 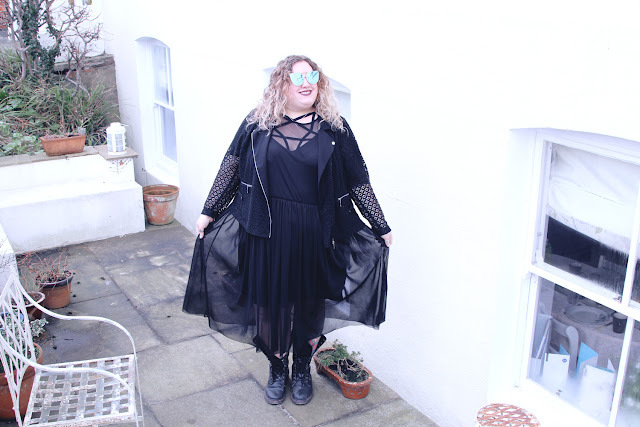 It's kinda biker chic meets goth princess. Really edgy and fun. Love the jacket! Oh I love love love this jacket! I think it needs to be hung in my wardrobe! This jacket is SO COOL! I love how you've styled it, especially with the harness bra under the mesh. You look awesome! Like a total rock and roller!